Clearly, the crowd down at City Hall is totally out of touch with reality. They’re completely caught up in the delusion that they’re creating a dazzling new urban landscape, when in fact they’re doing tremendous damage to the City. They say they’re planning for the future, but rational people know that planning for the future means starting with the cold, hard reality of the present. Here’s the reality. We don’t have enough water to support the current massive surge in development. Not by a long shot. Recently the Downtown News ran an article listing more than 90 projects planned for Downtown LA. You read that right. Nine zero. But that’s only the beginning, because there are large projects planned for the Crenshaw District, Koreatown, Hollywood, West LA and Warner Center. These projects will bring thousands of new residential units, along with office space, retail and restaurants, and they will boost water consumption in LA by many thousands of acre feet per year. Yeah, I know they’ll have drought-tolerant landscaping and low flush toilets. Let me repeat. These projects will boost water consumption in LA by many thousands of acre feet per year. Los Angeles, like the rest of the southwest, is facing a severe, long-term water shortage. The TV news tells us that the drought started four years ago, and everybody’s hoping it will end with El Niño. But the conditions that created this shortage have existed for decades. This isn’t just a matter of waiting out a few dry years until things get back to normal. This is the new normal. Lawns are turning brown all over LA as people try to decide whether to replace them or just let them die. Let’s start with some basic facts. LA gets its water from four sources, the LA Aqueduct, the California Aqueduct/State Water Project, the Colorado River, and local groundwater. Here’s a breakdown of how each of these resources has been compromised in recent years. The LA Aqueduct was dammed from April through October of this year. This was done because the DWP has been ordered by the courts to mitigate environmental impacts in the Owens Valley. That means that for roughly six months out of the year, LA received no water from the LA Aqueduct. This is the first time in the one hundred year history of the Aqueduct that it’s been dammed, but there’s a good chance it will happen again as snow packs in the Eastern Sierras continue to decline. The Metropolitan Water District (MWD), which serves LA, received only 20% of its allocation from the State Water Project (SWP) in 2015. The SWP depends on the Sierra Nevada snowpack for most of its water. On April 1, 2015, the statewide snowpack held only 5% of its average water content. Currently there’s no reason to believe that the decline of California’s snowpacks will be reversed in the near future, which means it’s likely that the MWD will receive only a fraction of its allotment for years to come. This year the Colorado River was the one bright spot in the water picture, and local agencies received 100% of their allocations. But don’t expect that to continue. The amount of water flowing through the Colorado River has been declining for years. Lake Mead and Lake Powell are hitting record lows. It’s almost certain that allocations from the Colorado River will be slashed in the years to come. For decades contamination from industrial waste has been encroaching on the wells in the San Fernando Valley. Right now about half the wells are closed. The DWP plans to build two new facilities to purify this water, but they haven’t even started construction yet, and it will be years before they’re completed. Now maybe as you read this you’re saying, Oh, come on. It’s not so bleak. The weatherman says that El Niño is going to bring torrential rains to LA. All we need is a good wet year to fill up the reservoirs and recharge the aquifers and we’ll be okay. The drought will be over. Right? Believe me, I hope we have a really wet winter this year. And if we get enough rain it could ease the drought for a couple of years. But it won’t solve the problem. All it will do is offer a reprieve. Because the problem is not that we haven’t been getting enough rain in LA. The problem is that the snowpacks that we rely on for most of our water are shrinking steadily. This is not a new phenomenon. Snowpacks in the Western United States have been declining for decades. Check out this report issued by the American Meteorological Society. It’s a lengthy document, and geared towards academics, so if you don’t want to plow through the whole thing I don’t blame you. Let me just give you this excerpt from the conclusion. even accelerate (Hamlet and Lettenmaier 1999a; Payne et al. 2004), with faster losses in milder climates like the Cascades and the slowest losses in the high peaks of the northern Rockies and southern Sierra. Indeed, the agreement in many details between observed changes in SWE [snow water equivalent, or water content of snowpacks] and simulated future changes is striking and leads us to answer the question at the beginning of this paragraph in the affirmative. It is becoming ever clearer that these projected declines in SWE, which are already well underway, will have profound consequences for water use in a region already contending with the clash between rising demands and increasing allocations of water for endangered fish and wildlife. This report was written in 2005. Ten years later, the authors’ predictions have come true. We’ve seen California snowpacks decline drastically, and the data seems to indicate that they will continue to decline. This isn’t just limited to the West or to the US. This is part of a global trend. Check out the report released earlier this month by the Earth Institute at Columbia University. According to the DWP, between 2006 and 2010 we got about half our water from the Metropolitan Water District (SWP and Colorado River), about a third from the LA Aqueduct, and 11% from local groundwater. The water that flows from the SWP, Colorado River and LA Aqueduct originates as runoff from snowpacks. From all indications, those snowpacks are going to keep receding for the foreseeable future. That means we can no longer rely on the resources that used to supply about 90% of our water. And as for the aquifers that supply us with groundwater, it will be at least five years before the DWP can build the facilities to clean it up. As the hillsides get drier, the risk of fire increases. There are lots of ideas out there about how to cope with this crisis, recycling, greywater, stormwater capture, desalination. All of them have potential, but it’s going to be a long time before any of them start producing the quantities of water we need for a city of nearly 4,000,000 people. We can’t afford to squander water, but that’s exactly what our elected officials are doing. By allowing rampant, reckless development with no real planning behind it, they’re giving away water that we don’t have. I am not saying we should put a halt to development. What we need to do immediately is make a realistic assessment of how much water will be consumed by all projects currently under construction, all those that are going through the approval process, and all those that are still in the planning stages. Then we need to set priorities, approving only projects that will truly benefit the people of LA, instead of continually greenlighting high-end high rises and luxury hotels. Next we need to make a realistic assessment of how much water we can expect to have, and this is a good time to do so. The DWP is currently working on its 2015 Urban Water Management Plan (UWMP), and a draft will be released for public comment early next year. We need to make sure that the UWMP accurately reflects our current situation. The Plan will certainly emphasize conservation, recycling and stormwater capture, and that’s all to the good. But it also needs to reflect the fact that every source of water the City has depended on for a hundred years has been severely compromised. Finally, we need to make sure that our elected officials acknowledge these limitations and start doing some real planning for the future. These days the people at City Hall are fervently, proudly, recklessly pro-development. That’s nothing new for LA politicians. This City was built by out-of-control, irresponsible development. Except for a few brief periods when voter backlash scared the people at City Hall, developers have almost always gotten their way. But that’s got to end. We can’t afford to keep doing business as usual. We don’t have the water. 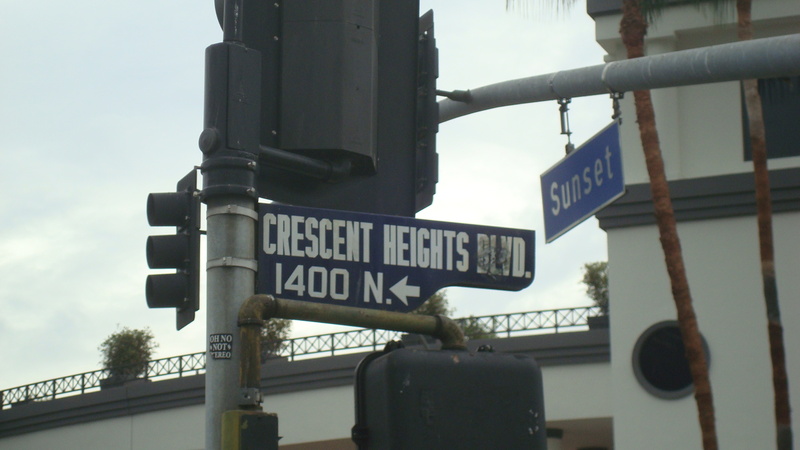 Last year I was elected to a seat on the Hollywood Hills West Neighborhood Council. It’s been interesting. On the one hand, I’ve made some good friends, and I have to say I’m impressed by the intelligence and dedication of the council members. On the other hand, it seems like the meetings never stop and the job requires sifting through endless amounts of information. It can be totally exhausting. But it’s gotta be done, because there are important issues that need to be addressed, and we can’t rely on city officials or developers to do the job properly. Take the 8150 Sunset Blvd. project. The HHWNC held a public meeting a few days ago to give stakeholders a chance to ask questions of the developer reps regarding the Draft Environmental Impact Report. To prepare for the meeting, I had to read as much as I could of the DIER, which runs about a thousand pages. It was a mind-numbing experience, but I’m glad I took the time. There were a number of areas where I felt the information contained in the document was inadequate, but the most troubling omission was in the area of fire safety. The LA Fire Department assessment states clearly that the 4 hydrants on-site have to provide a flow of 9,000 gallons per minute (gpm) for any of the high-rise alternatives. But the water main currently serving the site can only provide 3,750 gpm. Obviously, the water infrastructure has to be upgraded. So I went looking for specifics about how this was going to be done. The developer apparently has assumed responsibility for completing upgrades that will meet the needs for the project’s daily water usage, but they’ll need to do a whole lot more to satisfy the LAFD code requirements for a high-rise structure. For projects like this, the DWP has to complete a Service Advisory Request, basically assessing the developer’s needs and stating what needs to be done to satisfy the City’s requirements. The DEIR references SAR Number 38449, approved in July 2013, in a footnote, and says it’s contained in Appendix G. But it’s not in the appendix. So I thought I should contact the DWP to see if I could get hold of the SAR. On Monday I sent an e-mail to a DWP liaison explaining that the document was referenced in the DEIR, and asking if I could get a copy. The liaison wrote a nice e-mail back saying that he’d be happy to set up a meeting between DWP staff and the HHWNC in order to talk about the community’s water needs. I wrote back saying that I’d love to set up such a meeting, but I’d really like to get a copy of the SAR. That was on Thursday morning. I still haven’t gotten a response. Call me paranoid, but I’m getting kind of concerned. We’re not talking about a minor disagreement on landscaping or a few extra cars on the road. This is a basic public safety issue. The LAFD requirements are clearly stated in the DEIR. Any of the high-rise alternatives for this project need a 9,000 gpm fire-flow. If there’s a plan in place to achieve this, that’s great. I’d love to see it. I’d also like to see the SAR that the DWP prepared back in 2013. Compounding my concern are recollections of the water main rupture that flooded Sunset last year. I’m sure you all remember it, too, because it got plenty of media attention. In October, Wehoville ran an article on the flooding, and they quoted an e-mail from Steven Cole, of the DWP’s Water Distribution Division, to the West Hollywood Heights Neighborhood Association. In his e-mail, Cole said that the DWP was looking at replacing a 4 mile portion of a pipeline running along Sunset. He also said they were still analyzing the best way to accomplish that task. It makes me wonder if the DWP can guarantee that the water infrastructure needed to satisfy the LAFD requirements will be in place before 2018, when 8150 Sunset is supposed to be completed. Here’s the link to the article on Wehoville, in case you want to take a look at it. Does anybody else see cause for concern here? I’d feel a whole lot better if if could see the DWP’s SAR. I’ve asked them for it twice. I’m still waiting. Last week Mayor Garcetti asked Los Angeles residents to cut their water usage by twenty percent. Even though he was basically echoing the governor’s message to all Californians, this was an important step. Angelenos have slowly been climbing on board the conservation bandwagon, but we need to do more. Over eighty percent of the water we use in Los Angeles comes from outside the city’s boundaries. The only way LA has been able to grow as large as it has is by siphoning water from the Owens Valley and the Colorado River. But due to the current drought, these sources are drying up. In addition, many of the wells in the San Fernando Valley are contaminated, and cleaning them up will be a long, costly endeavor. Here’s a sobering article from the American Society of Civil Engineers web site. Not only do we need to conserve water in the present, we need to plan for water usage in the future. The City should take a hard look at current requirements for new projects, and ask if there are ways to build structures that are more efficient. In general, we need to look at how future development will impact our water resources. The City needs to consider the cumulative impact of proposed projects on our dwindling supply. Restaurants in particular should come under special scrutiny, since they consume a great deal of water in their day to day operations. There are a number of ways they can reduce their consumption. Replacing water cooled refrigeration units with air cooled units is a good start. They should also be required to use low volume spray nozzles for washing food. Composting waste instead of using a garbage disposal will also reduce water consumption. I know running a restaurant is difficult, and all these things cost money. Possibly the City could require new restaurants to take these steps, but allow existing restaurants to make the changes over time. And in the long term, adopting these practices will actually save restaurant owners money. The Department of Water and Power building is a classic modern structure from the sixties, designed by Albert C. Martin & Associates. 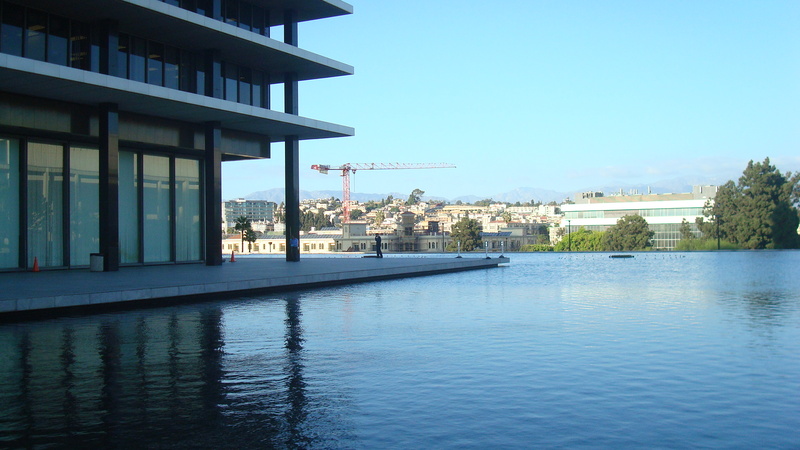 One of the key elements of the design is the reflecting pool that borders the site. It’s not just beautiful, it’s functional, having been integrated into the system that cools the offices. But it also plays an important symbolic role. 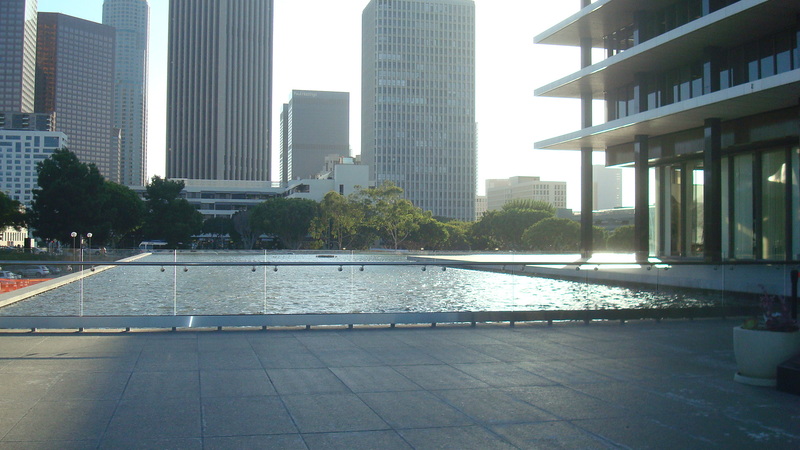 Surrounding the Department of Water and Power with an expansive reflecting pool makes a statement about how an area with limited water resources was transformed into a major city, known for its lush green lawns and sparkling swimming pools. Unfortunately, that isn’t the Los Angeles we’re living in today.